One of the ways to implement structured data on a site is by using Google Tag Manager – GTM – to do so. But John Mueller from Google is warning against using this implementation of structured data. A question came up on Twitter about the Google Structured Data Testing Tool not being able to recognize schema added to a page with Google Tag Manager rather than placing the schema itself on the page. While Mueller doesn’t address the issue with the testing tool not recognizing schema via GTM, he does say that GTM should not be the way structured data is added to a site. Interestingly, why there are some third party sites with instructions on implementing structured data with Google Tag Manager, there don’t seem to be any on Google’s own site. This could be because Google Tag Manager is actually a Google Analytics product, and not a Search or Search Console related product. And there should always be warning flags when an official Google tool is throwing warnings for how something is implemented, especially with how vital some types of structured data is to the appearance of pages in the search results, since added schema can influence click through rate from the search results. 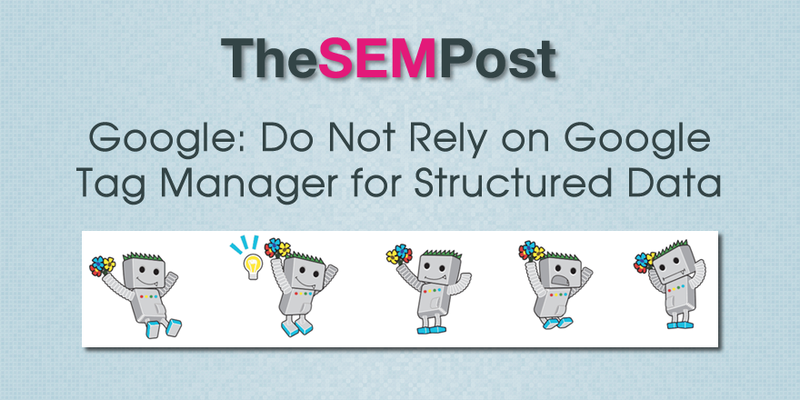 There have been some site owners complaining about errors implementing structured data via GTM recently, which could also be part of the reason why Google is not recommending this implementation. If you are using GTM currently for structured data and the rich features are showing up in the search results correctly, you probably don’t need to worry about it. But going forward, it seems Google is recommending implementing it on page instead of via GTM.